We at Special Operations Group are pleased to announce the new Marine Gunnery Sgt. Carlos N. Hathcock II Patch. 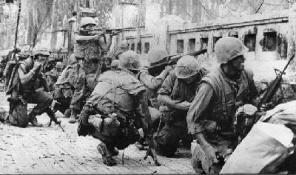 No Marine sniper was more effective than Hathcock at killing North Vietnamese and Viet Cong forces. The number 93 reflects his confirmed kills, but his actual total is believed to be well over 100. As a testament to his effectiveness, North Vietnam once put a bounty of $30,000 on his head. The Iraq War, or the War in Iraq (also referred to as the Occupation of Iraq, the Second Gulf War, or Operation Iraqi Freedom by the United States military), was a conflict that occurred in Iraq from March 20, 2003 to December 18, 2011, though sectarian violence continues since and caused hundreds of fatalities. Prior to the war, the governments of the United States and the United Kingdom claimed that Iraq's alleged possession of weapons of mass destruction (WMD) posed a threat to their security and that of their coalition/regional allies. UN partisan operations in Korea began more by chance than from planning. During the retreat in Nov-Dec 1950, thousands of anti-Communist North Korean citizens were left behind to fend for themselves. Facing almost certain death at the hands of the communist invaders, these people fought their way to North Korea's west coast and sailed to offshore islands where they prepared to fight a last ditch battle. The US 8th army eventually learned that friendly North Koreans still held the offshore islands. In January, the Guerilla Section, Eighth Army G-3 Miscellaneous, came into being. Operation Rolling Thunder was the title of a gradual and sustained US 2nd Air Division (later Seventh Air Force), US Navy, and Republic of Vietnam Air Force (VNAF) aerial bombardment campaign conducted against the Democratic Republic of Vietnam (North Vietnam) from 2 March 1965 until 1 November 1968, during the Vietnam War.